In 2007, Pierre Dubois, Managing Director of Pierre DeRoche, while hunting through the treasures harboured by an antique dealer friend of his, discovered some 19th century pocket-watch movement blanks with hour & quarter repeater and chronograph. As a worthy heir to four generations of brilliant watchmakers, his curiosity was naturally aroused by this discovery, and he decided to buy them. He showed them to his father, Gérald Dubois, a retired watchmaker still passionately dedicated to his art, and the latter naturally set about examining them in order to find their origin. Right from the start, Gérald Dubois was convinced they were LeCoultre movements, despite the lack of formal proof. Building on his certainty, he undertook a systematic comparison of one of these movements with the certified LeCoultre pocket-watches in his personal collection. The similarities were striking, but the precious “maker’s mark” could not be found. Gérald Dubois then took an interest in the 8172 patent number engraved on the mainplate. His research led to a decisive breakthrough when he consulted the Swiss federal registers which show a patent for a “New watch with pendant winding” dated May 5th 1894 and granted by the Swiss Federal Institute of Intellectual Property to Numa Robert-Waelti, a watchmaker in La Chaux-de-Fonds. Gérald and Pierre Dubois then began retracing the history of this watchmaker. 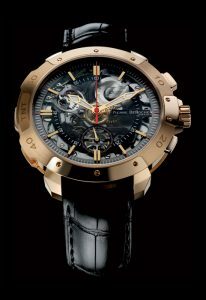 They consulted Daniel Aubert, a watchmaking historian based in the Vallée de Joux. They also sought advice from Mr Piguet, curator of the Watchmaking Museum in La Chaux-de-Fonds. Nobody knew anything of Numa Robert-Waelti. LeCoultre produced the movements in the late 19th century and delivered them to établisseurs, watch manufacturers who assembled the various parts of a watch. While these établisseurs were generally well-known brands, this was not the case for Numa Robert-Waelti. It is thus probable that the latter bought up LeCoultre movements, made certain modifications – such as the one bearing patent number 8172 – and then sold them to établisseurs. These over 100 year-old movements have probably changed hands several times before an antique dealer found them and in turn sold them to Pierre DeRoche. It was not until Gérald Dubois began taking the movements apart that the precious token of origin finally appeared. Engraved beneath the barrel bridge, and totally invisible on the assembled movement, was the “LeCoultre & Co” maker’s mark. These movements were made around the late 19th century in Le Sentier and vividly illustrate the expertise of the watchmakers of that era in the field of complicated watches. The movement is typical of that period. The frequency of the balance is 2.5 Hertz, meaning 18,000 vibrations per hour. 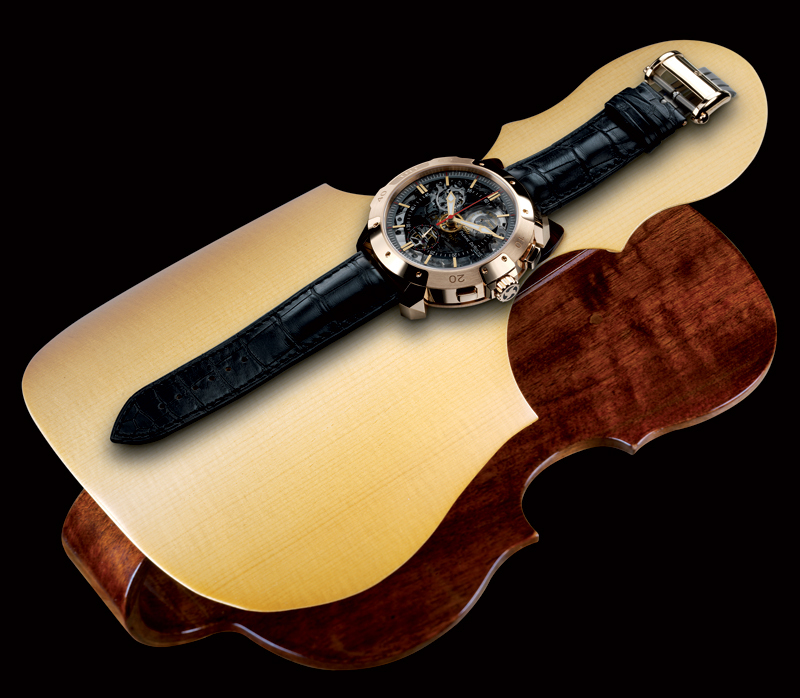 Winding is done by a winding-crown placed at 3 o’clock on the case. The winding stem has just one position, which serves for both winding and time-setting. The latter function is activated by a pusher at 4 o’clock that directly cooperates with the time organs on the watch. Releasing the pusher returns the watch to the normal winding situation. While Pierre Dubois wished to give a new lease on life to these historical movements by fitting them in wristwatches, he was nonetheless determined to maintain the original components, bearing witness to the proud watchmaking heritage of the Vallée de Joux. These “movement blanks” were thus restored, entirely decorated and then reassembled by the Dubois Dépraz master-watchmakers without any technical modifications, apart from the striking gongs and the regulating organs, which are contemporary. The expert Dubois Dépraz craftsmen meticulously decorated these three historical movements that now feature a circular-grained mainplate, bridges adorned with “Côtes de Genève”, a sunburst barrel, chamfered and hand circular satin-brushed wheels. The hour and minute wheels are openworked, as is the lower balance bridge, thus revealing the seconds wheel. The high-tech sapphire crystal dial of the BelCanto enables one to admire the movement through the front of the watch. First cut-out and drilled for the hands to pass through, the circular plate of synthetic sapphire – crystallised aluminium oxide that is almost as hard as diamond – is partially sandblasted, involving compressed-air projection of extremely hard particles to create a matt appearance. On the movement side, the sapphire plate is chrome-plated using PVD technology. A second PVD metallization is then performed to create the smoked areas. The black dial zones on the hand side of the dial are also created using this metallization technique. PVD plating involves physical (rather than chemical) vacuum deposition of metal particles. The particles thus applied are chrome, or titanium for the smoked zones. Black metallization is achieved by a coating of titanium-based particles of a different composition. Once the sapphire plate has been thus “prepared”, the non voluminous letters, numerals and hour-markers can be laser engraved. This type of engraving consists of attacking the sapphire surface with a laser beam and thus forming the letters, numerals and motifs. A varnish – white or red in this case – will then be placed in the hollow of these inscriptions so as to make them well readable. A “photoresist” varnish sensible to ultraviolet right is applied like a “mask” over the sapphire plate. The dial zones that are already decorated are safeguarded by exposing them to ultraviolet light, which makes the varnish resistant to the ensuing galvanic bath. The hour-marker zone is protected from the light, which means the varnish will then dissolve and mark out the area where the hour-markers will grow. The dial is then immersed into a nickel galvanic bath. An electrolytic process coats the non-masked area of the sapphire plate with a 0.2 mm thick layer of nickel. The hour-markers are then polished and coated with a thin layer of gold by means of a second galvanic bath. The back and the upper bezel of the imposing 55.5 mm case are fitted with two sapphire crystals. The case middle serves to bear the repeater slide and also guarantees water resistance to 3 atmospheres. The case middle also comprises an extremely precise chronograph shunt function that ensures its user-friendliness. The case is crafted in 750 (18-carat) rose gold, meaning an alloy composed of 75% pure gold, around 20% copper and around 5% silver. The dedicated slide at 9 o’clock activates the hour and quarter repetition. The hour hammer first strikes the hardened steel low-pitched gong to indicate the elapsed hours. Then the smaller quarter hammer and the hour hammer alternately strike the high-pitched and low-pitched gongs to indicate the quarter-hours. A watchmaker sets exactly the right tone by hand. The chronograph mechanism integrated within the movement features a classic style with a single pusher located at 2 o’clock. It is the “column-wheel” kind. The column-wheel is the distributing organ in a chronograph mechanism. This particular one is a 4/12 type, meaning 4 columns and 12 ratchet teeth, resulting in a ratio of three that means the chronograph is referred to as three-function chronograph with a single start, stop and reset pusher. The sequence of functions cannot be modified in this type of chronograph. A luthier known for his magnificent guitars was entrusted with creating a resonance instrument. Based on the same principle as violin or guitar soundboards, he created a base made from the wood of spruce trees from the Vallée de Joux. The sound of the repeater strike is thus magnified when the watch is placed on this base. Another artisan from the Vallée de Joux was commissioned to create the presentation box. 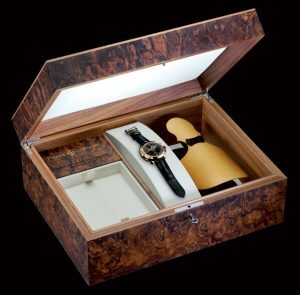 This cabinet-maker known for his custom-made creations for the region’s most prestigious watch companies designed an impressively sized burr walnut presentation box measuring 45 x 32 x 17 cm. This exceptional hand-crafted object was also lined in the Vallée de Joux.